Balzac, AB – New Horizon Mall is celebrating Valentine’s Day with a special event this Saturday, February 9th from 1:00 – 3:00pm. Not a typical mall, New Horizon is celebrating love with chocolate and classic Beatles music. There will be craft stations for the kids, prize draws and more. Events will begin at 1:00 pm with Brad Churchill, president of Alberta’s only chocolate maker, Choklat, leading an engaging and informative presentation all about chocolate. He will have you enjoying chocolate like never before. With its high tech Main Stage providing video capture, live streaming on a big screen and state-of -the-art sound system, New Horizon Mall is a great venue to see the All You Need is Love Beatles tribute band, that starts playing at 2:00 pm. This is an authentic tribute to the FAB FOUR and is Calgary’s premier Beatles tribute band. The band has all the infectious humour and incredible musical energy that made the Beatles the legends that they are today. 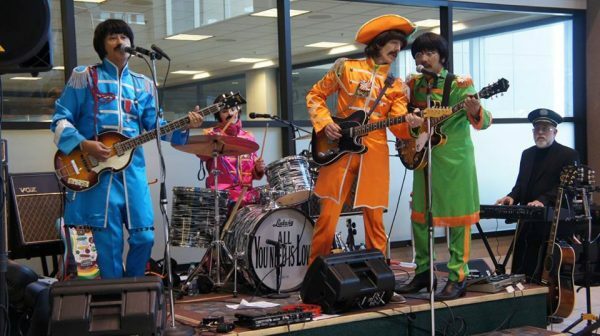 Photo Caption: Members of All You Need is Love Beatles tribute band from left to right Nathan Loo as Paul, Ven Guerra as John, Lloyd Ross as George, and Aaron Patton as Ringo. New Horizon Mall offers shoppers a new kind of shopping experience not found anywhere else in Alberta. It is a culturally diverse shopping experience with independent businesses showcasing unique products from around the world. With more than 60 stores now open, the mall is continuing to gain momentum in Rocky View County’s popular shopping district. Hungry shoppers can enjoy authentic Asian fusion cuisine at Matty’s Grill or a rolled ice cream treat from Frollies Ice cream or they can try out some Filipino snacks from J and E convenience. Unlike other malls which are occupied primarily by large corporations and chains, New Horizon Mall is a collection of small businesses, family enterprises and local entrepreneurs bringing unique products and services to the Calgary region.